Through the years, the Aunt Grace fabric collections from Marcus Fabrics have reliably become our favorite window to the early twentieth century. Fabric designer Judie Rothermel has yet again gone through her treasure trove of collected scraps to assemble something new from something old, fittingly named Aunt Grace Baskets of Scraps. All of the blocks in this book are familiar, tried-and-true classics, but they have been finished with original elements and techniques that we know you will enjoy! The patchwork border was selected as the perfect illustration of how our smallest pieces, our "basket of scraps", can combine to form one of our favorite elements of this quilt. Click here to download the Registration Form. You may return your completed Registration Form by email, snail mail, or hand delivering it to YVQ. If you choose to submit it by email or snail mail, we will call you to get your credit card information. 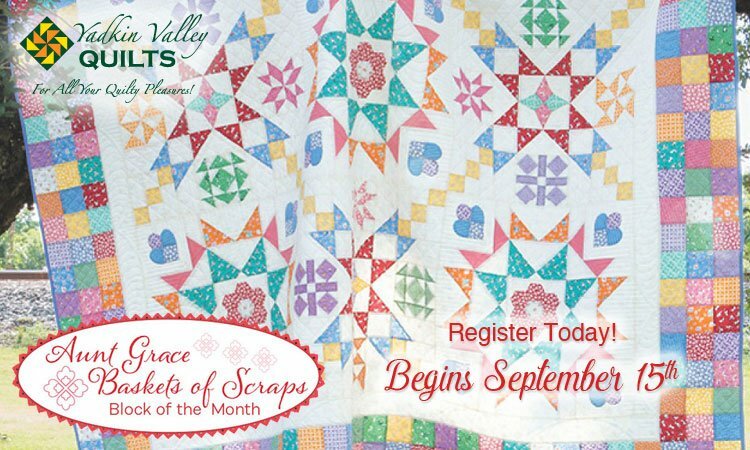 Payment of your $25 Registration Fee and receipt of your completed Registration Form hold your place in our Aunt Grace Baskets of Scraps Block of the Month Program. At the conclusion of this nine month program, you will receive $25 in Quilty Cash to be used in the shop on your next visit. We look forward to working through Aunt Grace's scrap basket with you to complete this gorgeous quilt that is certain to be a family treasure. Although the BOM is already in progress, there are still a limited number of spots available. Space is limited! Click here to register today! Requirements: Participants wishing to work on their project at YVQ are welcome to bring a sewing machine and basic supplies and do so on the day of the monthly block release. There is no additional charge to come and sew. Bring a lunch or order with us from one of the local restaurants.